News from the Australian wine industry. Read about new wine releases and more from experts like David Ellis, Winsor Dobbin, John Rozentals and Roderick Eime. WE always digress a little at this time of year to bring you our pick of some Christmas-stocking reading for a special someone into the enjoyment of wine. Written by wine educator, broadcaster and marketer, Robert Geddes it’s 300+ easy-to-read pages are jam-packed with the story of wine from the importance of where the grapes are grown (“soils ain’t soils,”) to their month-by-month life-cycle, the difference between making table, sparkling and fortified wines, and wine varieties including some we bet you’ve never heard of. Rob, who was only Australia’s third Master of Wine, also talks about what to look for in terms of bouquet and nuances of flavours on the tongue and through the nose, the importance – with examples – of matching food and wine, “glass rules,” and the difference between “great” and “boring” wine lists. 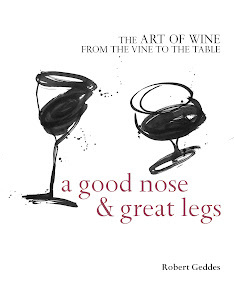 This is a most enjoyable book for those who already know something about wine, but want to know more: and you’ll enjoy his lively writing style that ranges from the racy to the delightfully droll and quirky. Our founder, David Ellis has been writing about his love of wine and the importance of matching the right wine to the right food for three decades. Now enjoying semi-retirement (and a few good wines), he had previously looked after media relations for some of Australia’s premier winemakers including Lindemans, Leo Burings, Hungerford Hill, Briar Ridge and Westend Wines. Follow Roderick's board Vintnews on Pinterest. Picture Window theme. Theme images by Barcin. Powered by Blogger.